"Jumping from 'doing science' to 'applying science' is not easy. It requires a much broader understanding of the natural 'system', which includes not only the underlying science but various social and political aspects as well." For more information, visit Dr. Kling's website on these events. In this lecture we will examine a specific case of an environmental problem and what is being done to solve the problem. 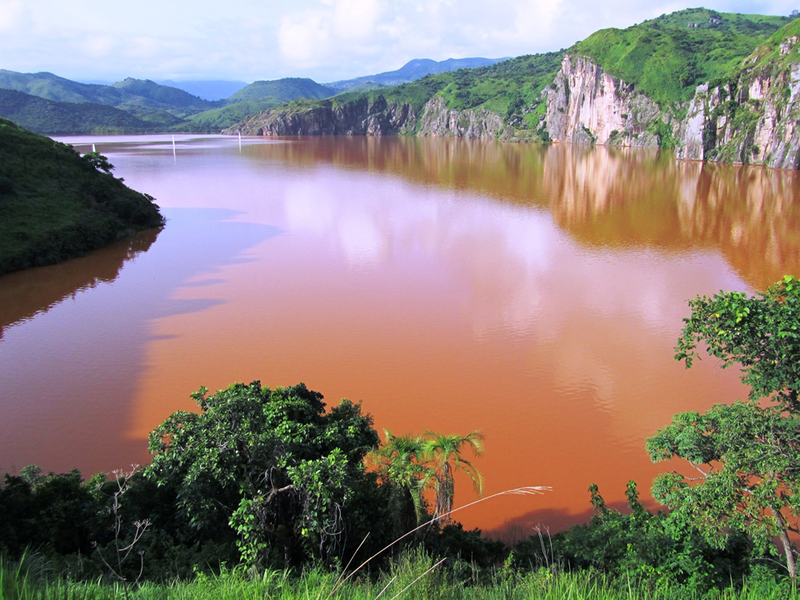 This is the case of the killer lakes of Cameroon. By using biogeochemical principles, and by studying the whole system including element cycles, physics, and chemistry, these lakes became better understood to the point that remediation of their natural hazards is possible. 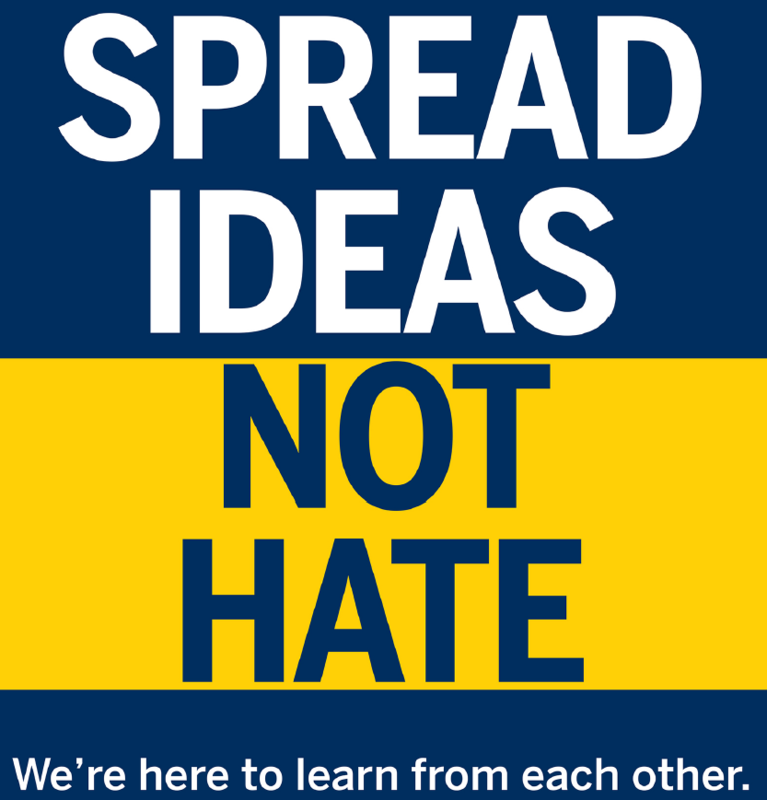 We have presented many examples of "problems" in our world so far in the class, such as global warming, sea level rise, increasing greenhouse gases, acid rain, and so forth, and now we'll take a look at how we can use some basic scientific principles such as those we have also discussed and apply them to a particular problem. We will also discover that in order to actually solve problems, the "system" that we need to understand is larger and more complex than the science alone would indicate. The natural hazards of killer lakes arise when enormous amounts of dissolved CO2 gas trapped in the bottoms of these lakes is released suddenly. 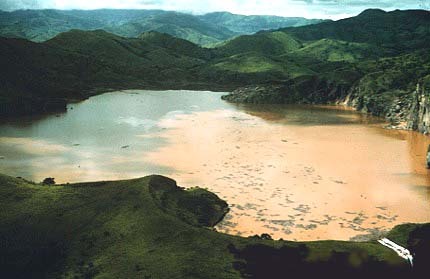 In August of 1986 Lake Nyos in Cameroon "exploded", releasing up to 1 km of CO2 and killing about 1700 people up to 26 km (13 miles) away from the lake. A smaller gas burst from Lake Monoun in August of 1984 killed 37 people. There are several aspects of these disasters that we need to understand, and they include the build-up of the gas, the release of the gas, and the remediation of the hazards. Natural hazards created by the lethal release of large amounts of gas from lakes are very rare. Only three lakes in the world are known to contain high concentrations of dissolved gas in their bottom waters: Lakes Nyos and Monoun in Cameroon, and the much larger Lake Kivu in East Africa (on the border of Rwanda and the Democratic Republic of the Congo, DRC). Only two of these lakes, Nyos and Monoun, are known to have recently released gas resulting in the loss of human life. Three conditions are necessary for CO2 accumulation in lakes to reach dangerous levels. First there must be an abundant source of CO2, and second a lake must be strongly stratified, a situation where the bottom and surface waters do not mix, in order to trap the CO2 in bottom waters. Third, the lake must be deep enough to contain gas at very high pressures. Geological conditions in much of Cameroon are favorable for the generation of CO2 gas, as Mt. Cameroon is the only active volcano in West Africa. The "volcanic line" that contains Mt. Cameroon also contains many CO2-charged soda springs found throughout the country. The gas from these springs is discharged harmlessly to the atmosphere - there is no way for the gas to build up to dangerous levels. However, in most of Cameroon's crater lakes (formed by volcanic activity), sheltering from the wind and great depth help to create stable stratification. The rare combination of gas-rich springs feeding into deep, stratified lakes led to the buildup and eventual violent release of gas from the bottom waters of Lake Nyos in 1986 and Lake Monoun in 1984. Previous investigations have shown that these conditions do not occur in any other Cameroonian lakes, and no other lakes in the world besides Lake Kivu are known to contain dangerous amounts of CO2. These were not volcanic explosions (events). The gas that was released was stored in the bottom waters of the lake before the event, rather than being injected through the lake by an underlying volcano. The gas originated from magma (molten rock) about 80-90 km below the lake, and rose through the fractured rock beneath the lake until it got to the surface and dissolved in groundwater. The groundwater was then injected into the lake in these CO2-charged soda springs. This source of the gas was identified by scientists because the chemistry of the lake bottom water was very similar to the chemistry of the springs feeding into the lakes. The gas buildup occurred relatively slow over time (decades to centuries), rather than the gas being injected all at once such as might occur in a volcanic event. Conditions that are required for gas release include the weakening of the strength of stratification. Stratification is weakest when the surface waters lose heat, which is a function of decreasing air temperatures and decreasing solar energy input that occurs during the monsoon season. This monsoon season occurs in August in Cameroon, and may explain why both Nyos and Monoun exploded in August. Both events also occurred in the mid-1980's, and if the gas was built up slowly over time then the probability of both events happening so close together is very small. This is probably explained by the long-term trends of climate in Cameroon -- lower than normal temperatures and higher than normal rainfall in the mid-1980's. The gas contents of these two lakes continue to build, supplied by the input of CO2 from underground springs that discharge into the bottom of the lakes. The exact trigger for a gas burst is unknown although any disturbance that moves deep, gas-rich water closer to the surface could result in a gas release. As that deep water rises, the weight of water above it (the hydrostatic pressure) decreases, and at some point the dissolved gas pressure will become equal to the hydrostatic pressure. At this point there is nothing to force the gas to remain in solution, and gas bubbles begin to form. This process is identical to the removal of the cap from a bottle of soda -- when the cap is removed there is no more pressure to keep the gas dissolved in the soda, and bubbles are formed. Once bubbles are formed in the lake they rise rapidly and drag the deep water toward the surface, at which point additional deep water is drawn upward and depressurized. This leads to a chain reaction that eventually results in the violent release of enormous amounts of lethal CO2 gas. Because the gas content of these lakes is currently very high, catastrophes similar to those in 1984 and 1986 could occur at any time. Both lakes continue to increase their levels of gas in the bottom waters. This buildup provides evidence for the hypothesis that the gas is input slowly over time rather than injected during a volcanic event. Nyos and Monoun could become saturated with gas (that is, the gas pressures at the bottom will equal the hydrostatic pressure) in 10 to 30 years, respectively, if the gas input rates remain constant. The natural hazards presented by these lakes are unique in that remediation is possible before a disaster occurs. The procedure involves pumping of gas-rich bottom waters to the surface of the lakes through pipes. As the bottom water moves toward the surface the dissolved gas comes out of solution and forms bubbles. These bubbles lower the density of the gas-water mixture, and they expand, causing the fluid in the pipe to rise rapidly toward the surface. The picture at the left shows the initial degassing fountain installed in Lake Nyos in 2001. The pipe reaches almost to the bottom of the 210 m deep lake. Although the pipe diameter is only about 13 cm, the expansion force of the tremendous gas pressure at the bottom that is released as the fluid moves up the pipe drives the gas-water fountain about 50 m into the air. In addition, the velocity of the gas-water mixture at the pipe opening is supersonic. 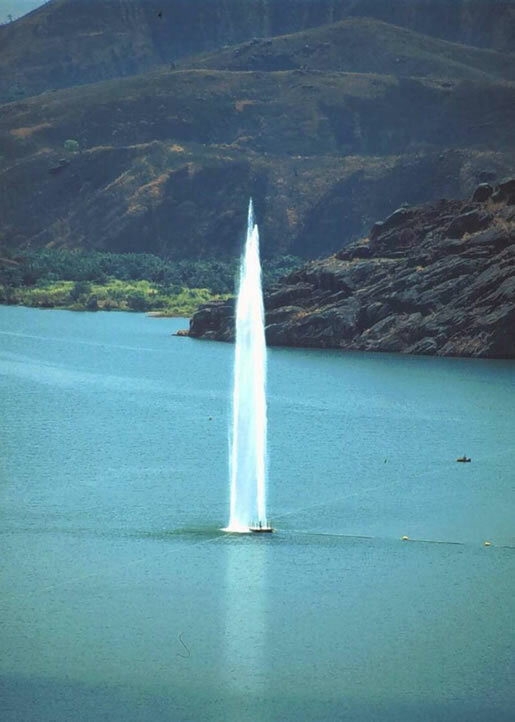 In the initial gas burst at Lake Nyos, a gas-water fountain was produced that was at least 80 m high and washed over a large rock promentory in the lake with enough force to erode away the soil and vegetation down to bare rock. In addition, a surface wave was produced that was at least 25 m high. Therefore, tremendous energy was released by the dissolved gas as it expanded during the gas burst in 1986. The energy released during degassing is sufficient to drive the pumping operation without any external power source. Such a plan was first tested on a small scale, and continuous degassing at Lake Nyos began in 2001. In addition to removing the gas currently in the lakes, it is possible to prevent future gas buildups using a pipe that continuously flushes bottom water out of the lake. Degassing operations at Lake Monoun began in 2003, and today this smaller lake is completely degassed and safe for the surrounding populations. In 2010 two more degassing pipes were added to Lake Nyos - the three pipes now operating can be seen in the picture at the left. Because the 3 pipes are bringing up large amounts of iron-rich bottom water along with the dissolved gas, the lake has again turned red, just like it did right after the 1986 explosion. As of 2012 about 40% of the total gas in the lake had been removed. However, until the lake is completely degassed using the method described above, the people living around the lakes are at risk. Relocation of survivors from the Lake Nyos event has already occurred. However, in part because these people have now been refuges from their homes for over a generation, they are moving back into the evacuated region, and the number seems to increase each year. There was no relocation of survivors around Lake Monoun, but the population around the lake has increased in recent years, and new farmlands have been occupied very close to the lake shore. There are many social, cultural, and political aspects of the degassing plan and how it will affect the local populations. In addition to the gas hazard, at Lake Nyos, the spillway or natural dam that holds back the upper 40 m of the water column is weak and is eroding rapidly. When the dam fails it will produce a flood that could affect 10,000 people in the floodplain below. Any attempt to lower the lake level could result in release of gas that is contained in the sediments, due to the decrease in overlying water pressure, which could trigger another event. To address this additional hazard from the weak dam, in 2012 work started on reinforcing the dam at Lake Nyos. The mitigation plan is to first reinforce the dam by injecting concrete into the structure, while the gas concentrations are being lowered in the lake. When the gas concentrations are sufficiently low, then the upper 40 m of the dam could be removed and eliminate the potential hazard from flooding altogether. As mentioned above, the third lake in the world known to contain dangerous concentrations of dissolved gas is Lake Kivu on the border of Rwanda and Democratic Republic of Congo in East Africa. This is a giant lake, containing 1000 times more CO2 in its bottom waters than does Lake Nyos, and with millions of people living around the shoreline this is the world's largest ticking time bomb. In addition, Lake Kivu also has large amounts of methane gas dissolved along with the CO2. The situation at Lake Kivu is also different because there are nearby active volcanoes that could destabilize the lake and trigger a gas burst. There are actually volcanic vents that form seamounts on the bottom of the lake, so, it is just a matter of time before this bomb explodes. To compound the problem the dissolved methane gas pressure has been increasing over time, and if the rates continue the total gas pressure (CO2 combined with methane) will reach saturation and trigger a gas burst in about 100 years. Although it’s probably hopeless to try and degas the lake with the small pipes used in Nyos and Monoun, and the cost would be prohibitive, there is one possible solution for this hazard. It turns out that the methane stores in the lake rank as the 5th largest natural gas (methane) deposit of any country in the world. The idea is to place offshore platforms with pipes to extract the gas, just like at Nyos, but to separate the methane from the CO2 and send it across the lake to a power plant on shore. 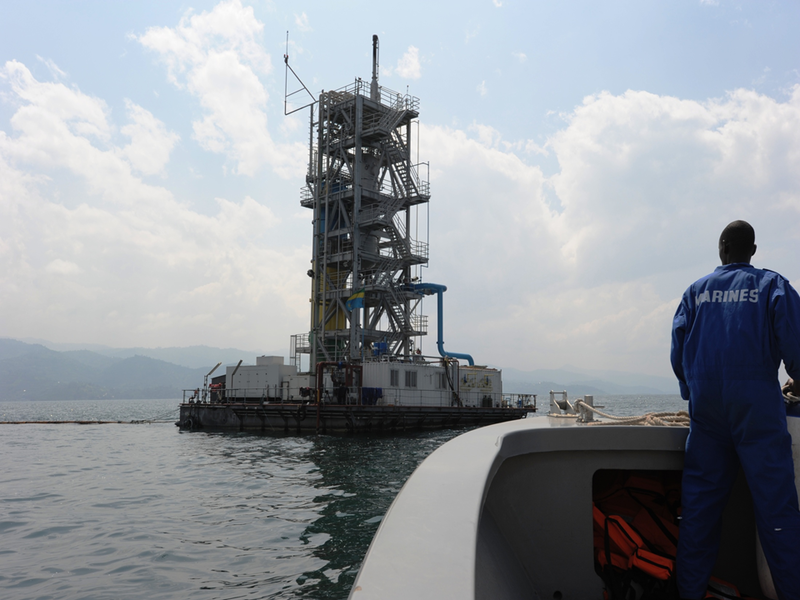 The first methane-extraction, power-production test plant started operating on Lake Kivu in 2009, and is shown in the picture to the left. The plant draws water up from ~300 m depth in a 0.75 m diameter pipe, and then separates and purifies the methane from the CO2. The methane is then sent in a surface pipe to shore, where it is burned in methane-fired generators designed to produce electricity. This first test plant can produce up to about 5 MW, and the first full-scale power plant will produce about 35 MW. This amount of pwer will double the current power output of Rwanda, and that power will be 5 times cheaper than the diesel they now burn for power. The prospect of such great generation of cheap power has now altered planning for power needs and availability in other East African countries. As the methane is withdrawn over time, the danger to surrounding populations decreases. Thus this time bomb in the lake may actually be a salvation for this very poor and developing part of the world. One of the most interesting aspects of the Lake Kivu power generation plan is related to its sustainability. Because the lake is producing methane (the methane gas pressures are increasing over time), there is the possibility to withdraw just enough methane for power generation to balance the natural methane production. If this is done correctly, it would be a brilliant success story for turning a natural hazard into a sustainable operation that both reduces the hazard and provides great benefits at the same time. Did Gas Bursts in the Geologic Past Cause Rapid Climate Warming or Mass Extinctions? In 1996 a researcher at the University of Michigan, Youxue Zhang, had the insight that these gas bursts from lakes are very similar to the gassy eruptions of magma from volcanoes, and can be modeled in the same way. Essentially, the surrounding water column in the lake acts like the rock conduit does in a volcano, constraining the eruption upward. This meant that gas bursts could also come from oceans, and could potentially be many times more massive than what was observed at Lake Nyos. This led to the hypothesis that gas bursts in Earth's geologic history were responsible for rapid global warming at the end of the Paleocene period (~55.8 million years ago), and potentially for the greatest mass extinction known on Earth, at the end of the Permian (~251.4 million years ago). Both of these ideas rely on the presence and release of enormous amounts methane hydrate stored in ocean waters or sediments. The methane would act as a greenhouse gas and warm the planet, and in the case of mass extinctions the methane could be ignited at the surface and create continental-sized fires. One important piece of information in support of these ideas is that the methane would inject "isotopically light" carbon into the atmosphere, which is what has been detected in the geological record but never before explained. The scientific evidence for the causes of these natural disasters is now well established. But there are other aspects to consider, which include potentially differing points of view of the scientists compared to the local population compared to the government. Our basic assumption is that reducing the danger of these hazards is good, but people must be first educated about the risks involved and then they need to decide for themselves what level of risk they are willing to tolerate. For example, the people living around earthquake-prone areas such as San Francisco must accept the dangers of the area, and they balance those dangers with their desire to live there. In Africa there may be less mobility for populations living near hazards, but the main contribution of science in this arena is to inform people about the risks. Of course there are additional cultural and political issues that surround almost all decision-making aspects of environmental problems or natural hazards, and these must be dealt with in the same careful and comprehensive way in which we do our science. The functioning of these ecosystems is largely controlled by physical and chemical processes. The physical aspects of lake morphology, lake stratification, and of climate control the overall buildup and release of the gas. The chemical aspects of groundwaters and dissolved gases control the inputs of gas to the lake, whereas the total amount of gas that can accumulate in the bottom of the lakes is controlled by the lake depth and size. The gas is released when there is a disturbance of the water column in the lake, the stratification breaks down, and gas-saturated water is moved toward the surface where the ambient pressure is reduced and the gas comes out of solution (forms bubbles). These natural hazards can be reduced and eliminated by pumping of gas-rich bottom waters to the surface, where the gas is released to the atmosphere in and slow and regulated manner. Making "problem solving" decisions depends on a thorough understanding of the science and the evidence for scientific interpretations that underlie the problem, but also includes aspects such as different points of view, agreement on basic assumptions, and the purpose of making the decision. These aspects are related to social, cultural, and political factors that must be studied and understood as part of the whole "system", which includes the underlying science.